In the digital era, news has become omnipresent. Americans access it in multiple formats on multiple platforms on myriad devices. The days of loyalty to a particular news organization on a particular piece of technology in a particular form are gone. The overwhelming majority of Americans (92%) use multiple platforms to get news on a typical day, including national TV, local TV, the internet, local newspapers, radio, and national newspapers. Some 46% of Americans say they get news from four to six media platforms on a typical day. Just 7% get their news from a single media platform on a typical day. The internet is at the center of the story of how people’s relationship to news is changing. Six in ten Americans (59%) get news from a combination of online and offline sources on a typical day, and the internet is now the third most popular news platform, behind local television news and national television news. The process Americans use to get news is based on foraging and opportunism. They seem to access news when the spirit moves them or they have a chance to check up on headlines. At the same time, gathering the news is not entirely an open-ended exploration for consumers, even online where there are limitless possibilities for exploring news. While online, most people say they use between two and five online news sources and 65% say they do not have a single favorite website for news. Some 21% say they routinely rely on just one site for their news and information. To a great extent, people’s experience of news, especially on the internet, is becoming a shared social experience as people swap links in emails, post news stories on their social networking site feeds, highlight news stories in their Tweets, and haggle over the meaning of events in discussion threads. For instance, more than 8 in 10 online news consumers get or share links in emails. The rise of the internet as a news platform has been an integral part of these changes. This report discusses two significant technological trends that have influences news consumption behavior: First, the advent of social media like social networking sites and blogs has helped the news become a social experience in fresh ways for consumers. People use their social networks and social networking technology to filter, assess, and react to news. Second, the ascent of mobile connectivity via smart phones has turned news gathering and news awareness into an anytime, anywhere affair for a segment of avid news watchers. 17% say they read news in a national newspaper such as the New York Times or USA Today. Americans today routinely get their news from multiple sources and a mix of platforms. Nine in ten American adults (92%) get news from multiple platforms on a typical day, with half of those using four to six platforms daily. Fully 59% get news from a combination of online and offline sources on a typical day. Just over a third (38%) rely solely on offline sources, and 2% rely exclusively on the internet for their daily news. Most news consumers utilize multiple platforms for news, but online their range of specific outlets is limited. The majority of online news consumers (57%) say they routinely rely on just two to five websites for their news. Only 11% say they get their news from more than five websites, and 21% regularly rely on just one site. Moreover, many do not have strong loyalty to particular online sources. When asked whether they have a favorite online news source, the majority of online news users (65%) say they do not. Among those who do, the most popular sites are those of major news organizations such as such as CNN and Fox. Internet users use the web for a range of news, but local is not near the top of the list. The most popular online news subjects are the weather (followed by 81% of internet news users), national events (73%), health and medicine (66%), business and the economy (64%), international events (62%), and science and technology (60%). Asked what subjects they would like to receive more coverage, 44% said scientific news and discoveries, 41% said religion and spirituality, 39% said health and medicine, 39% said their state government, and 38% said their neighborhood or local community. News consumption is a socially-engaging and socially-driven activity, especially online. The public is clearly part of the news process now. Participation comes more through sharing than through contributing news themselves. 75% of online news consumers say they get news forwarded through email or posts on social networking sites and 52% say they share links to news with others via those means. 51% of social networking site (e.g. Facebook) users who are also online news consumers say that on a typical day they get news items from people they follow. Another 23% of this cohort follow news organizations or individual journalists on social networking sites. Some 37% of internet users have contributed to the creation of news, commentary about it, or dissemination of news via social media. They have done at least one of the following: commenting on a news story (25%); posting a link on a social networking site (17%); tagging content (11%), creating their own original news material or opinion piece (9%), or Tweeting about news (3%). 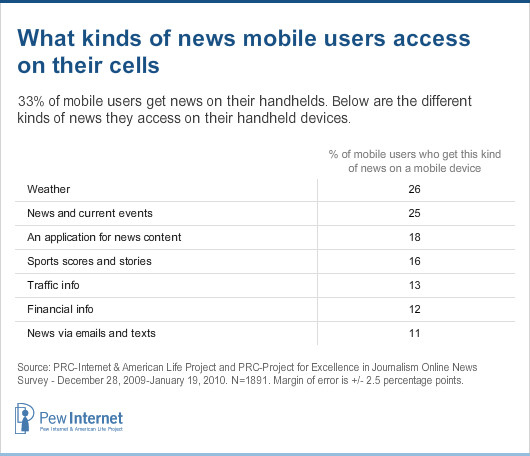 Wireless news consumers have fitted this “on-the-go” access to news into their already voracious news-gathering habits. They use multiple news media platforms on a typical day, forage widely on news topics, and browse the web for a host of subjects. Some 28% of internet users have customized their home page to include news from their favorite source or topics and 40% of internet users say an important feature of a news website to them is the ability to customize the news they get from the site. Moreover, 36% of internet users say an important part of a news website to them is the ability to manipulate content themselves such as graphics, maps, and quizzes. News is easier to follow now, but overwhelming. And most topics get plenty of coverage, in Americans’ eyes. Americans send mixed messages in the survey about how they feel in a world where news is updated constantly and they can access news all the time. We asked respondents about how the volume of news might play into this: “Compared with five years ago, do you think it is easier or harder to keep up with news and information today?” Some 55% say it is easier, only 18% say it is harder. One quarter of adults (25%) say there is no difference between now and five years ago. Good news, bad news about media performance. When it comes to the quality of coverage itself, respondents give correspondingly mixed signals. Just under two-thirds (63%) agree with statement that “major news organizations do a good job covering all of the important news stories and subjects that matter to me.” Yet 72% also back the idea that “most news sources today are biased in their coverage.” Some of the explanation for this dichotomy seems to be rooted in the views of partisans. Liberals and Democrats are more likely to say the big news organizations do a good job on subjects that matter to them, while conservatives and Republicans are the ones most likely to see coverage as biased. 1. Note that our question framing in the current survey is somewhat different from surveys that ask about consumers’ news consumption behavior “yesterday” or about the specific frequency of their news consumption. Instead, in the current survey, respondents were asked in one question whether, on a typical day, they get news from each of the following: local television news; national television news; local print newspapers; national print newspapers; or radio. Later in the survey, those who were identified as being at least occasional online news consumers were asked if, on a typical day, they get news from any one of 14 different online sources, ranging from the website of a national newspaper or television news organization to Facebook or Twitter posts of journalists, news organizations, or other people they follow. When answers to the two questions are combined, 99% of American adults say that on a typical day, they use at least one of the 5 traditional news sources or 14 online news sources asked about. This number may be higher than other estimates of daily news consumption because 1) respondents are asked about a “typical day” rather than “yesterday,” and 2) they are asked about a number of “non-traditional” news sources which may prompt them to recall behavior they might not otherwise consider when asked about their daily news consumption.